I replaced all the plastic fuel lines during my glowplug replacement exercise. Good news: Glowplugs work great, check engine light off, no fuel leaks from the items I touched. 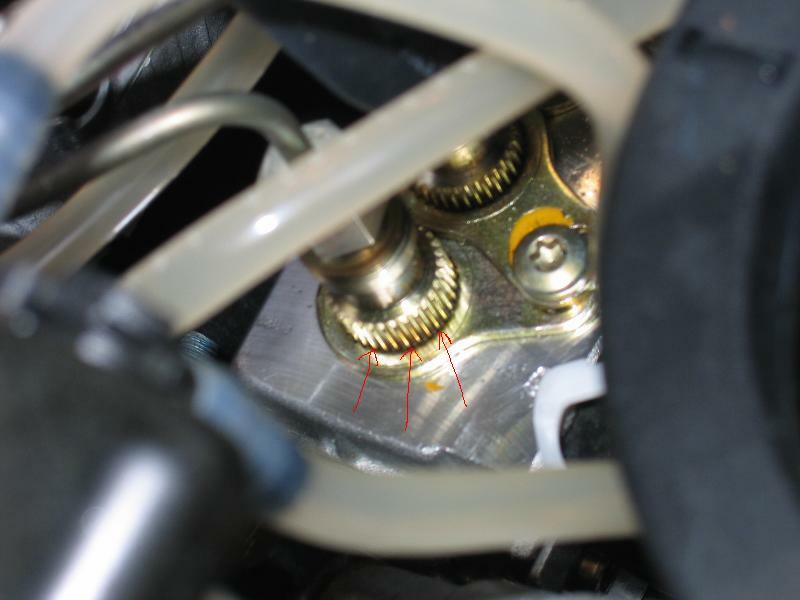 Bad news: The number one "Pressure Valve Holder" on the Injection Pump is seeping fuel. I thought it might be the fuel shutoff valve but careful inspection indicates the fuel welling up from between where the anti-rotation rings encircle the splined area on the Pressure Valve Holders. The "Torque Striping" is intact...no attempt seems to have been made to tighten them in the past. Last edited by deltajetfixer; 04-06-2005 at 08:31 PM. Injection line loose from replacing a glow plug? I didn't have to touch the lines when I did the glowplugs. I checked the hexagonally shaped "B-Nut" to see if it was loose on the off-chance the fuel was wicking down to the base of the Pressure Valve Holder (PVH) but it was tight. It's obviously, unfortunately unmistakeably leaking from the PVH right at the base of where the locking/antirotation rings contact the splined shoulder of the PVH. Ahhh...so I do have a snowball's chance then, eh? The tool looks exactly like what I'm looking for. I wonder if the parts for an OM603 are backwards-compatible with an OM606? I think the pumps are virtually identical, with the exception of the governor and fuel rack management section. Those parts and the socket are cheap enough to give it a try. Check out the delivery valve seals/o-rings for an '87 300D, and you should locate a suitable replacement set. Try a dealer, that looks just like a 603 pump. You will need o rings that run about $.50 each and some crush washers that run about the same. You can do all 6 or just that one. Make sure you use a good torque wrench and follow the torque specs. I would try to find 606 specific torque specs. I'm ordering the 32 splined socket today. More TOOLS!!! Would you happen to know the torque specifications? I've been reading that the OM603 pump has a procedure that calls for tightening/loosening, tightening/loosening, ...any similarities? I assume that the o-ring is for the junction between the metal fuel line and the splined injection pump bolt that requires the copper washer underneath replaced? I had this done on my '97 soon after I picked it up. Same symptoms with the top of the injection pump leaking. Anyone have any diagrams of this procedure? I'm curious as if the day scomes that I removed my injectors for service I'll know how that whole assembly is put together. Anyone replace those metal injector lines? Are they expensive? -- After replacing all of these fuel lines and the washers on the top of the injection pump, is there any way or need to prime the fuel system? Or does one just keeping cranking till she fires up? They run about $33 each on the 603, I would only replace them if they are leaking. This procedure is for the 603, but it might help. Last edited by Hatterasguy; 03-14-2019 at 07:39 PM. I'll take pictures of when I do it and post the results. I have cutaway views out of the Factory Shop Manual. I'll post them when I get home this afternoon. Yep. Keep cranking until it fires. There is no manual primer on the W210 chassis E300 version of the OM606. I have the same fuel seepage on my pump. I still have some trepidation about tearing into the pump though. Will I need to tighten the pressure valve down to any particular torque? Any internal pieces I need to pay extra attention to? Any comments would be appreciated. BTW, this is the third fuel leak I have had on my e300d in 4 months. Buy, borrow or rent the splined tool or carry the car to the dealer!!!!!! Get the parts ( a copper gasket and an o ring) and remove the injection line on the leaking injector. When you tighten that cap using the splined tool, you can feel when that washer is crushed, and if you have never felt a crushed copper washer before, (like when you tighten the oil drain plug after you change the oil and feel a slight crush) take the car to a dealer, because you don't want $1.12 to cost you a Mercedes. Simple job! The only problem that I know that you can run into is that you "UNDER TORQUE" the cap and the copper washer doesn't crush and make a leak tight seal and the excessive fuel can and probably will, enter the engine oil chamber and over fill it and "IGNITE" and cause you to have a "run away" engine, which I can guarantee you that you do not ever want to experience. Anyway, make sure you tighten that cap and crush that copper washer with appropriate force to mash a copper gasket! The bigger problem with the leak on the 602, is that fuel goes right into the engine mount.